Are you constantly wishing your mattress was just a touch softer or firmer? You’re in luck! 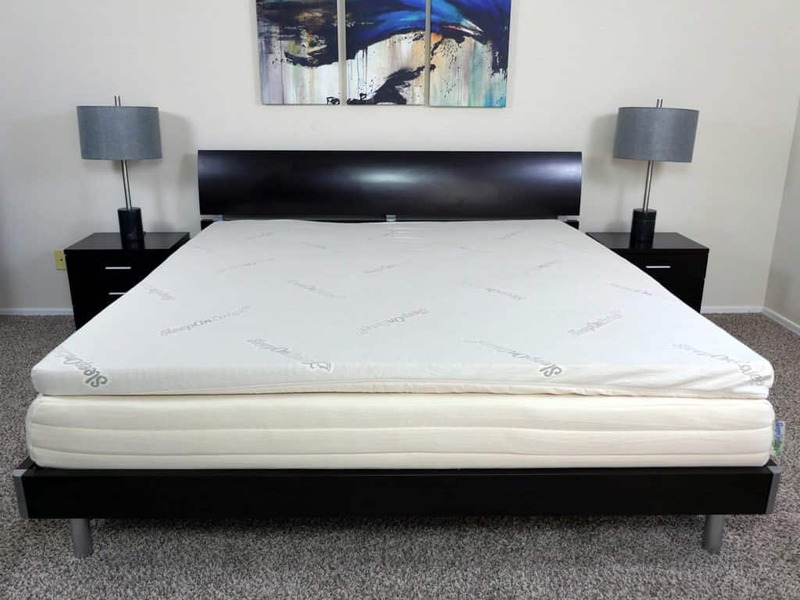 Today we’re taking a look at the Sleep On Latex natural latex topper, available in 3 different thickness levels as well as 3 different firmness levels. For the purpose of this review we decided to take a look at the most popular topper, the 2″ soft model. Will this topper actually soften up the mattress without decreasing support or sleeping warm? Continue reading below to find out! Don’t have time to read the full review? Not to worry. Click here and we’ll bring you straight to the review summary. The Sleep On Latex Pure Green natural latex mattress topper is constructed from a 100% natural Dunlop latex. No synthetic latex materials, fire retardants, or fillers are used in this topper whatsoever. This design was implemented in order to create a softer, cooler, and more responsive feel. By using a Dunlop latex, the topper is supportive, reactive, and springy, but does not have the increased level of bounce that Talalay latex often provides. Sleepers have the option of purchasing this topper in three different thicknesses. The level of thickness is not intended to change the feel of the topper much, but rather give the sleeper the option of different heights to place on top of their mattress. Additionally, Sleep On Latex offers an organic cotton cover that can be added to the topper. For this test, we went ahead and ordered the topper with the organic cotton cover. Made from a blend of organic cotton (80%) and polyester(20%) this cover is designed to add an extra layer of protection to the mattress pad. While some may prefer a 100% organic cotton cover, Sleep On Latex decided to use a small amount of polyester to avoid shrinkage when washing the cover. The Sleep On Latex Pure Green natural latex topper (soft model) adds quite the notable level of softness to virtually any mattress. Atypical to the more traditional memory foam toppers / mattress pads, the Pure Green steers away from the pronounced contour and hug and leans more towards a deep level of sinkage with less of an enveloped feel and quicker response times. As I first lied down on the topper, I sank almost entirely through the 2″ of material. Keep in mind, I only weigh about 140 pounds. Even though I was close to sinking through the topper, I did not feel as if I was being trapped by the latex foam whatsoever. Instead, the mattress topper was able to sink with me and respond immediately as I rolled over or changed positions entirely. By having such a fast response time the Sleep On Latex topper was able to add that nice degree of softness and avoid any sort of stuck feeling. The first test I completed with the topper was used on top of a firmer mattress. The mattress I tested comes in at an 8 out of 10 on the firmness scale, where 10 is the most firm. Yet, after placing the topper on the mattress, I felt as if it had dropped to a 5.5 out of 10 on the firmness scale. That said, I did not see much of a difference in terms of support. Instead, the topper seemed to have added the softness and pressure relief without changing the support of the mattress below. Next up was the Sleep On Latex mattress. For the purpose of my review, I tested the 9″ medium firm Sleep On Latex mattress. Per my experience with this mattress, I felt as if it landed between a 6-6.5 out of 10 on the firmness scale. After adding the topper, the mattress was reduced down closer to a 4.5 out of 10. Compared to my experience on the firmer mattress, I definitely enjoyed the topper more so on the latex mattress. Yet, as far as support is concerned I felt as if it were essentially an identical experience to the firmer mattress. The topper offered improved pressure relief and softness, but as I sank through it I was back to depending on the support of the actual mattress itself. For most sleepers, I believe the case will be the same with regards to the soft version of this topper. The mattress will feel softer, but there is not very much support added to the mattress as a whole. I would like to note, the cooling of this topper was great. As a 100% latex topper with an organic cotton cover there was a high level of breathability. Not once did I feel as the Sleep On Latex mattress topper created a warmer sleeping surface. Smell – there was a heavy smell after removing the topper from the packaging. That said, this odor was gone in less than 48 hours. Read the full Sleep on Latex mattress review here. Should I buy the Sleep On Latex natural latex mattress topper? 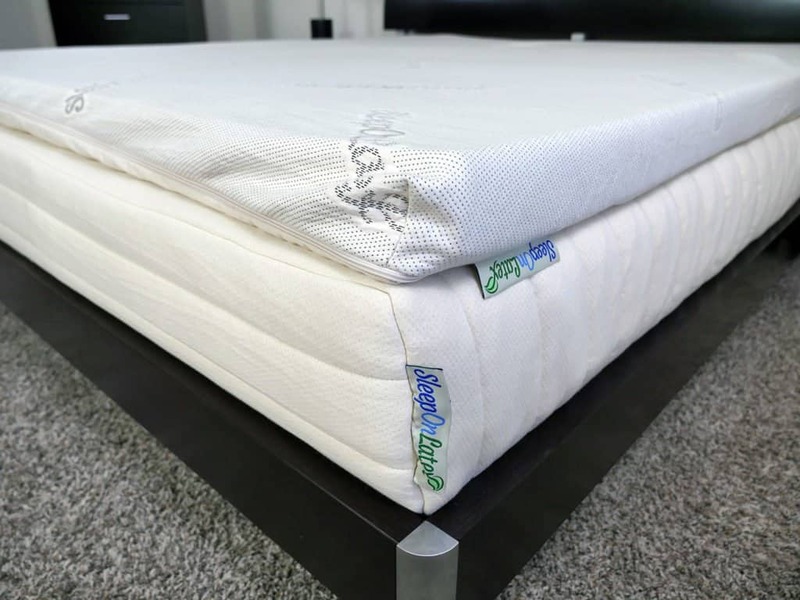 Want to soften their mattress anywhere from 20-30% – by adding the Pure Green natural latex topper to your mattress you can expect to see a firm mattress move to more of a medium feel and a medium mattress to more of a soft feel. That’s a movement of between 2-2.5 points on the Sleepopolis firmness scale. Bear in mind, this is based on the soft version of the topper. 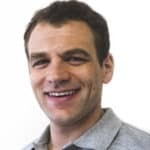 I would expect the firm version to increase firmness by that 20-30% margin and the medium version to increase or decrease firmness by 10-15%, depending on if it’s placed on a soft or firmer mattress. Want a latex topper – by adding a latex topper to your mattress you will see improvements in response time, bounce, and cooling. You’ll want to be sure you’re a fan of a more responsive feel before moving forward with this topper. Want organic / natural products – as a 100% natural latex, this topper is one of the most organic options Sleepopolis has tested to date. If you’re looking for a topper, but want to avoid any chemicals or synthetic materials, the Sleep On Latex topper is certainly a good choice. 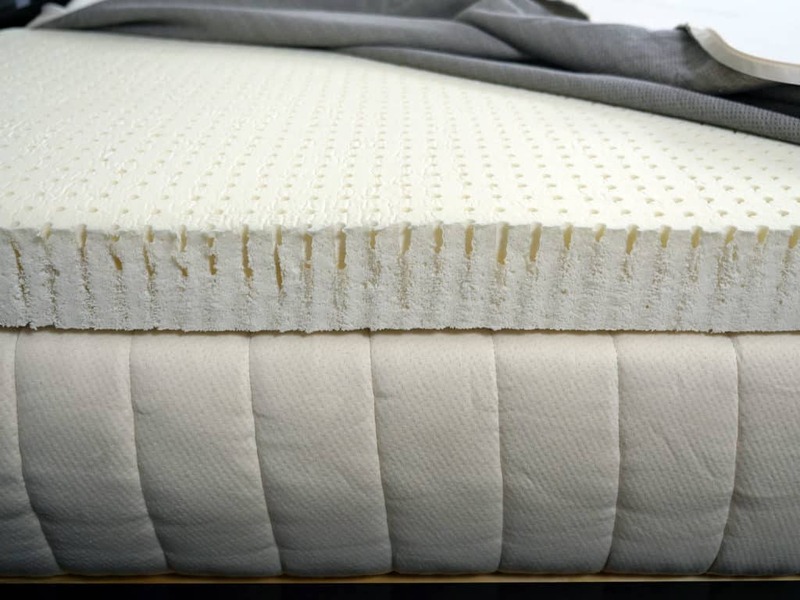 Still looking for a little more information on the Pure Green natural latex mattress topper? Visit SleepOnLatex on Amazon.com. The Sleep On Latex natural latex mattress topper is a well built, responsive topper that has the ability to provide a softer or firmer feel, depending on your preference. 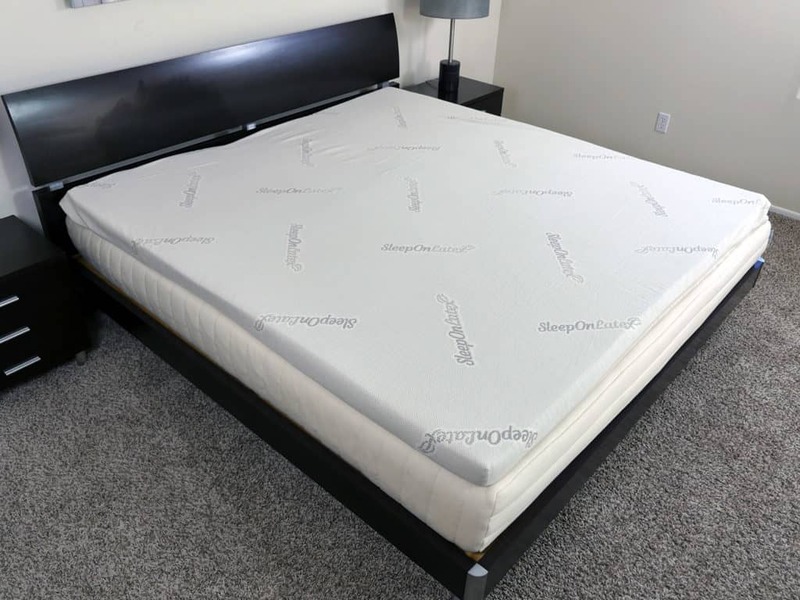 With a 100% natural latex foam and the option to add an organic cotton cover, the Sleep On Latex is one of the most natural toppers I have tested to date. If you’re a fan of a true latex feel, this topper is certainly one to consider.